Passenger: "I was scared... it was flying very near to our plane"
Canadian fighter jets have escorted a Cathay Pacific airliner to land at Vancouver airport after receiving an alert of a bomb threat, officials said. 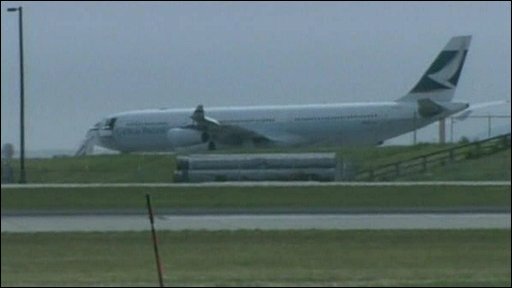 The Vancouver-bound flight, which originated from Hong Kong, landed safely at 1340 (2040 GMT) and was towed to a secure part of the airport. Canadian police told the BBC the plane had been screened and no explosives were found. The police spokeswoman said the bomb threat had been received by telephone. The passengers, all unharmed, were taken off the plane, while police investigated the alert. The two CF-18 jets were scrambled after the threat was received. The jets, acting under the orders of the North American Aerospace Defence Command (Norad), took off from a base at Comox, on nearby Vancouver Island and returned after flight CX 839 had landed. "As a precaution, Norad fighters escorted the aircraft until it landed safely in Vancouver," said Maj Holly Apostoliuk. Disembarked passengers described their ordeal. One said: "I saw one fighter plane with us, when we were 80 miles away from the airport, and when we landed he was gone." He went on: "I was scared because he was flying very near to our plane - very, very near." Another said passengers had been given no information. "The security personnel were kind enough to keep the stress levels down, but I guess all of us were kept in the dark," he said. A third said: "They told us there was some sort of terrorist problem and the baggage would be held up."